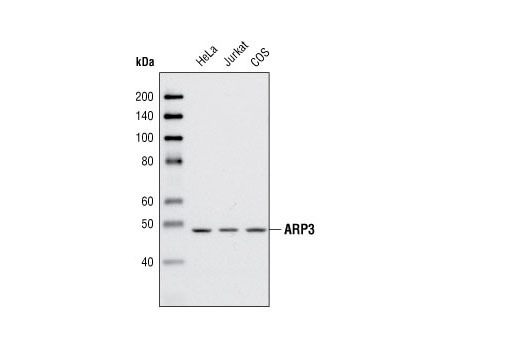 ARP3 Antibody detects endogenous levels of total ARP3 protein. The antibody does not cross-react with endogenous levels of total ARP2 protein. Polyclonal antibodies are produced by immunizing animals with a synthetic peptide corresponding to the amino terminus of human ARP3. Antibodies are purified using protein A and peptide affinity chromatography. Actin nucleation, the formation of new actin filaments from existing filaments, affects actin filament structure during cell motility, division, and intracellular trafficking. An important actin nucleation protein complex is the highly conserved ARP2/3 complex, consisting of ARP2, ARP3, and ARPC1-5. The ARP2/3 complex promotes branching of an existing actin filament and formation of a daughter filament following activation by nucleation-promoting factors, such as WASP/WAVE or cortactin (1). The formation of podosomes, small cellular projections that degrade the extracellular matrix, is enhanced by ARP2/3 complex action. ARP2/3 competes with caldesmon, an actin binding protein shown to negatively affect podosome formation (2). Along with N-WASP, the ARP2/3 complex regulates nuclear actin filament nucleation and controls actin polymerization during transcription (3). Morita, T. et al. (2007) J. Biol. Chem. 282, 8454-8463. Yoo, Y. et al. (2007) J. Biol. Chem. 282, 7616-7623.